if the blogger has never been to South Cotabato and has not attended any T'nalak Festival celebration, just post about 15 things of what it might be like to visit and experience T'nalak Festival for the first time. Posts can include first-person anecdotal experiences or travelogue-style writing. All entries must be written and posted between July 19 until July 29, 2012. No reposted material will be considered. Entry must have at least 300 words and must include photos. Only one (1) entry per blogger. Register using the form found at the end of this post. 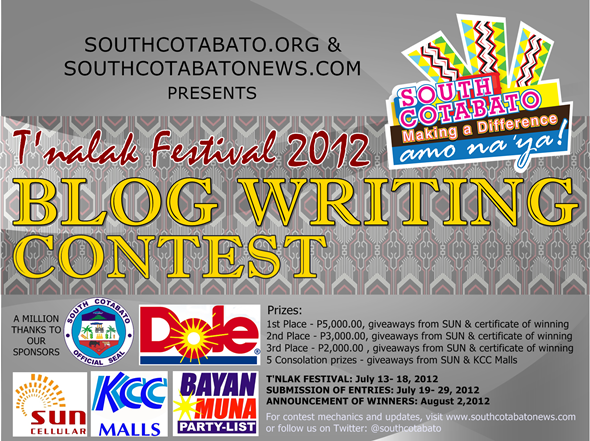 Add SouthCotabatoNews.Com or SouthCotabato.Org to your blogroll. After writing the blog entry, participant should post a COMMENT in this blog post that should contain the LINK to his/her ENTRY. Deadline of submission of entries will be on July 29, 2012 at 12nn: entries after the cut-off time will not be considered. From the qualified entries, we will choose the Three Best Blog Entries which will each win a major prize and 5 others will each win a consolation prize courtesy of SUN Cellular. Winners will be announced throughout the day on August 2, 2012.Always check back at this site for updates.